MPact Wealth Reviews - Legit or Scam? MPact Wealth Reviews – Legit or Scam? 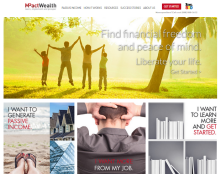 MPact Wealth, found online at MPactWealth.com, is an organization which says it can train people how to earn a generous passive income which can help them save college money for their kids, or provide them with a secure retirement. Customers who wish to use their services will get access to their Complete Home Study Course, a three day Intensive Live Training Event, an hour long debt reduction strategy session, a wealth building strategy session, and a copy of The Wealthy Code by George Antone. The MPact Wealth program provides you with something called “The Banker’s Code Home Study Course,” an 8 week course which gives people “all the tools you need” to start generating income through private lending. Private lending is also called “peer to peer lending,” and is a form of earning money by lending money to other individuals, the way banks do, except you are the one who gets to collect the interest or other investment residuals. Specifically the website says it teaches people how to “make money like the banks,” to use tactics for becoming a private lender with private money sources, how to structure deals to optimize your profits, and how to prevent and handle whatever problems may arise. It is hard to say. Companies that specialize in training and live seminars for real estate investment opportunities suffer from negative reputations within the independent earning industry. In addition, this company does not provide any up front information about pricing. Instead, they ask you about your current earnings and what you hope to get from your future passive earnings with this company, and then you are told that someone will contact you to discuss the opportunity. The MPact Wealth website says that they do offer a Refund Policy for customers who are unhappy with what they receive, but people who are interested in actually paying for their services may want to see this Policy in writing and fully understand the details of it before they agree to make any purchases or investments. Average Rating for " MPact Wealth Reviews " is 2.17 out of 5 based on 6 reviews. George Antone has some great things to teach, but they are all hypothetically profitable. I am involved with any loans and several people, and have made little return, and hope to be able to recover what constitutes most of my retirement funds. The things that have saved me are real estate deals that he was discouraging me from doing. I wish I had never met the man. I write about & object to their "making money" on judgment liens on real property. Would imagine you have to spend some dollars to get "trained." Now, 1) who as a lien holder sophisticated enough or had advice to have put a lien on real property would hand you a purchase option on it for a lousy $ 1? 2) if the company chooses to "partner" with you, your acceptable deal (extremely if not impossible to find) is surely worth more than a 25% cut to you. 3) if you find a deal (very difficult) acceptable to the company, you can bet your bottom dollar it's way worth more than the $ 2,000 birddog fee they offer you. In all the years the company has touted this judgment lien thing, I want to see and review just 5 examples that they can show of each of the 3 methods that actually occurred in real life, done or submitted by its trainees who had paid their hard-earned money to "learn." What they teach is OK, but how they teach it makes it really hard to make an income. They are really trying to get you to buy the next level of training. Also, private lending is really risky...they don't talk enough about the risk. The "Platinum Community" which is the last step in the process is full of sharks looking to make money on naive under trained investors. You will spend about $22-25K to get into the training. It works like this. Step 3: The Platinum Community - it's about $13K for the first year. The Platinum Community meets 3 times a year and has some OK content and nice people along with sharks. The Deal Sponsors make the most money...they take points on the front end -- so if the deals goes long or defaults, they make their money first. What they teach you to do while you're still naive enough to think you'll make money is to be an "OPM" partner. Make the margin on other people's money. Huge risk, not worth the headache for the small return. Imagine taking your mom's savings and investing it for a 6% return...and you make an additional 2-4% on it over the course of a year. Really? You've just put your mom at risk for this? They are not clear enough about the risks and how to protect yourself in this training. You can learn the basics from the first course, but beware of the sharks in the community. Thank you for this info. Are you still apart of the Community. I was thinking about joining. My husband and I are students of MPact Wealth. I can't say enough good things about the company. It's not cheap. But it is good for us, price keeps all the negative people away from the community. We have done also Rich Dad training, so we can compare how much more MPact team cares about student's susses. George and his team created outstanding training, but it's not for everybody. I typically do not leave reviews, but I felt that I had to object a 2 star review of somebody that didn't even bother to taking a first class or to talk to a current student. In any case, I hope that negative and skeptical people not going to get to those classes. Is it worth the cost? Have you done well with the information.? Sorry for the late response. "Is it worth the cost? " The answer is it depends. If you take all the classes and find out that you really uncomfortable with risk and uncomfortable taking other people money to invest then it is not for you. When an investment goes bad you take responsibility, use your reserves to make it right with your investors and recover and restructure the deal. This is training for people that know they will lose money here and there and they will make money here and there and if you plan it right you will make more then you lose, then this is a class for you and it well worth it. And yes, you can lose your mom's savings, so don't take more from her then she can afford to lose. This is review an opinion from someone who has seen their website but hasn't gone to any of their training. Nuff said.